I saw the new Tilda Swinton movie “I Am Love” this weekend. The movie was fantastic. I don’t want to divulge too many details about the film (you have to see it), but one of the characters is an Italian chef. Now, I am by no means comparing myself to an Italian chef (especially the one in the movie), however, watching the film made me crave something simple, filling, Italian, and inexpensive. 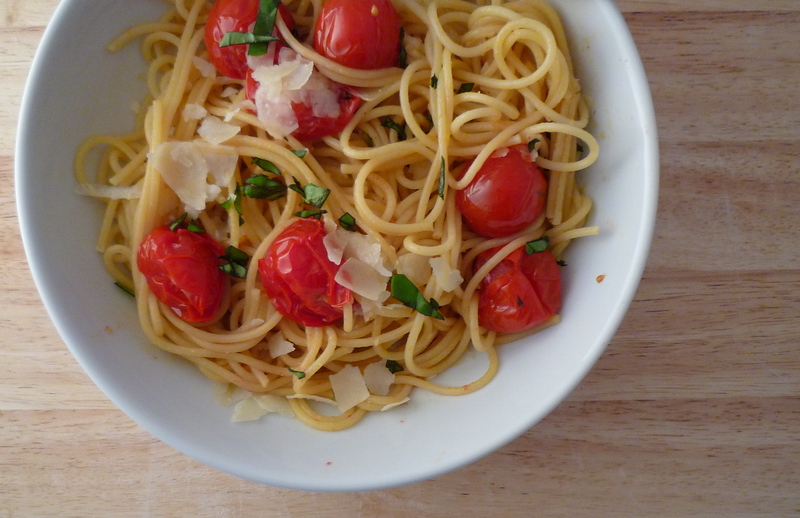 I made spaghetti with garlic tomatoes and topped it off with a little fresh basil. We still aren’t quite in tomato season yet, but they are beginning to show their plump little faces at the farmer’s market and I am very excited about it. Dice up 4-5 cloves of garlic. Saute in pan with olive oil. 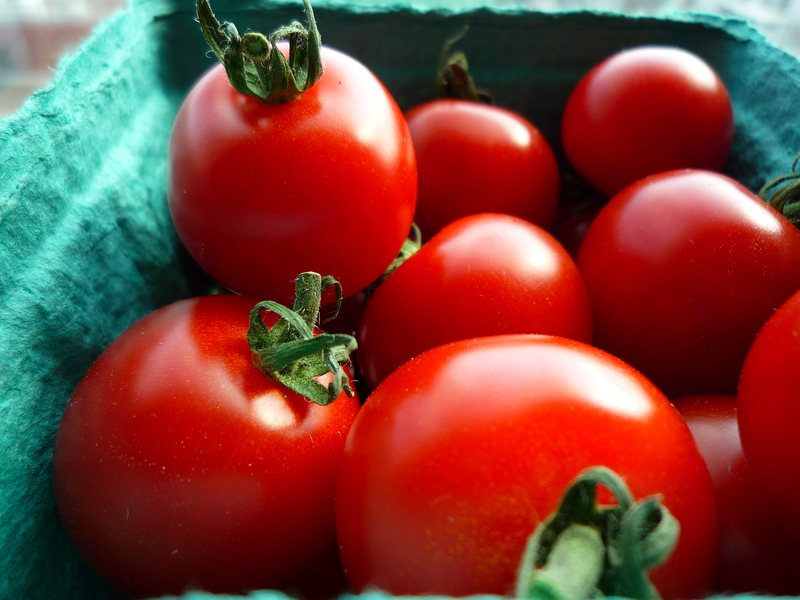 Rinse tomatoes and remove stems. Add to pan with a pinch of salt and saute on low heat. I like to let the tomatoes cook until the skins just start to burst. Cooking the tomatoes like this allows the skin to keep some of it’s integrity, but the tomato almost melts in your mouth when you bite into one. Bring pot of water to boil, add spaghetti and cook until al dente, about 8-10 minutes, depending on what type of pasta you are cooking. I used spaghetti because the tomatoes were quite large and round. 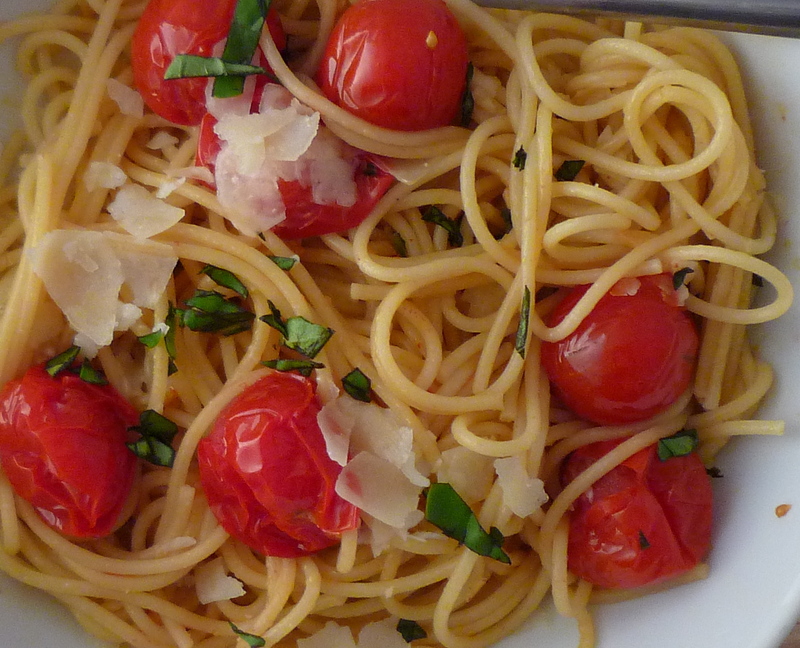 If you are using smaller grape tomatoes, I recommend using capellini instead of a thicker spaghetti. Once you have drained the pasta, add to pan with tomatoes and saute quickly together. Plate spaghetti and top with freshly grated parmesan cheese and chopped basil. Parmesan- $4.25 for the container…I have been slowly eating the cheese for the past 2 weeks. If you don’t want to go over budget, skip the basil. It adds a bit of sweetness to the dish, but it’s really not necessary.